Wow! Great coverage and article. I didn't realise I had a Great Helen caterpillar on my curry plant. Had to flick it away...sorry. It was very persistent though, I put it on another potted plant about 2 feet away and next day it was back on the curry plant. I'm in the Teck Whye HDB area. Are there other green caterpillars with this eye pattern that I could've been confused with? Thanks, Mike for your kind words. 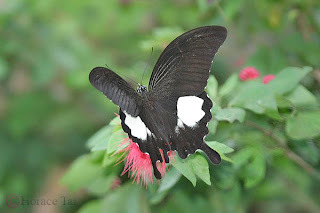 Based on the recorded host plants for various Papilio species, the caterpillar you described as persistently going back to the curry plant should be that of Common Mormon (Papilio polytes). 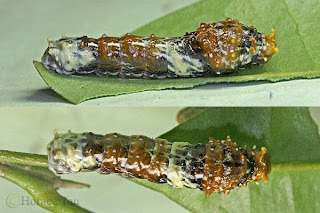 Of course there is a possibility that it is one of the other Papilio species, as the caterpillars of Papilio do look alike, being bird-dropping like in the early instars, and green body with eye spots in the final instar. 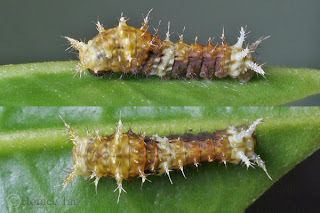 Differences in the final instar usually come in the form of having different colours in the markings, and some details in the markings. 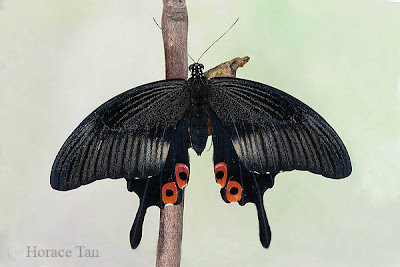 great post on the great helen.. i've always wanted to see a living, breathing specimen of this butterfly but they unfortunately seem extremely hard to come by. someday perhaps.. 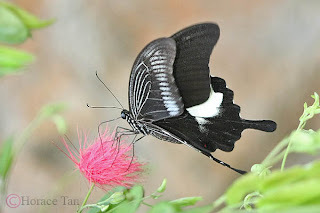 The place which offers a best chance to see a Great Helen in the wild is MacRitchie Nature Trail, either on the board walk or on the trail proper. Best of luck. Thanks for your reply Horace, very interesting. 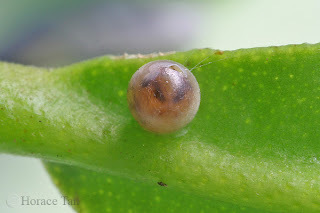 Are there any pictures of the common mormon's instars on this blog or elsewhere? I wish I had taken a photo. 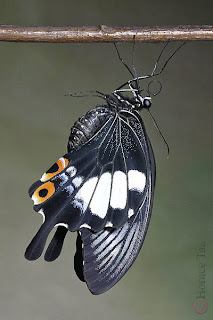 I think I've also had the pupa of the banded swallowtail on my front door once. Monitored it and one day saw the butterfly flutter off. 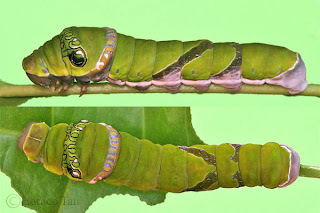 Interesting note on that possible pupa of banded swallowtail. Did you manage to capture a shot of that butterfly which fluttered off? An interesting looking Papilio caterpillar you have there. The oblique band at segments 3 and 4, and the one at segment 5 are not fully formed or connected. I cannot tell for sure the species ID at this stage as there could be further changes to these bands as the catepillar grow. Possible IDs are Common Mormon and Lime Butterfly IMHO. Do keep an eye on the caterpillars and take note of the adults when the time comes. Horace, agree that it looks more like the lime butterfly. 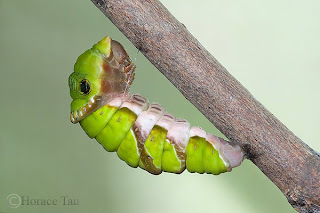 Roughly how long would I have to wait to see the pupa and butterfly? 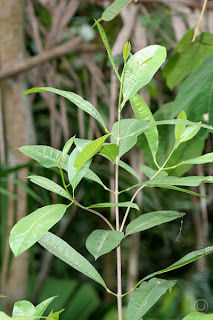 My wife's getting a little frantic because it's devoured almost all the shoots of our small pot of kaffir lime. 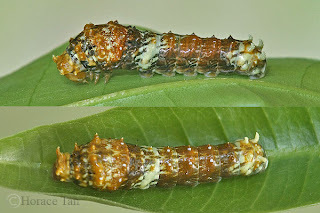 Do you think it is possible to cut a few leaves/twigs and place the 2 caterpillars in a box...will they pupate indoors? Am just worried that when they finally come out I won't get to see it before it flies off. 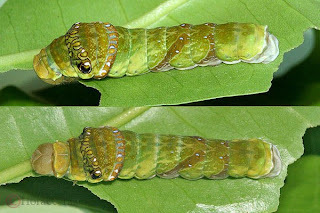 The final instar of the Papilio consumes quite a bit of the lime leaves compared to the earlier instars. With two of them, you might want to consider getting another pot of the kaffir lime. 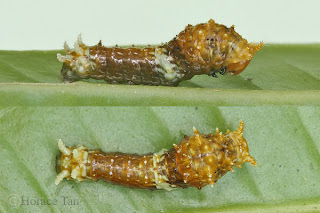 My estimate is about 3 to 5 days for the final instar before it stops feeding. It will be a good idea for you to house them in a plastic container with leaves/twigs as you suggested. Firstly you will be sure that they will pupate and eclose in it, so that you can ascertain their ID. Furthermore, you will eliminate the risk of bird and parasitoid attacks on the caterpillars. 3 to 5 days!!?!! Can't wait! Half the plant is gone today when I checked and the two caterpillars plump as pumpkins. So is it ok to move them now? The earlier you move them, the lesser chance they are exposed to risks I mentioned before. Hi Horace, am back with some pictures. 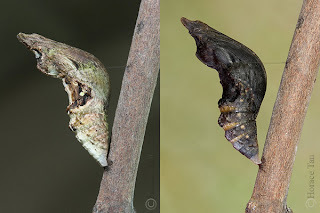 The first one is the 'older brother' and the second was still in the caterpillar stage when the former had already pupate. They are now both indoors and in the pupa stage. I almost lost older brother but finally found the pupa hanging on my curry plant, so I chopped the section and have put them both in a glass vase. Am quite keen to take up the challenge of photographing the eclosions...any idea what time I should keep awake? I read the eclosion photography article, hope I'll have enough patience. You patience and care pay off! Congrats for successfully having two pupae on hand. You might want to get in touch with Bobby, the man behind the blog article on eclosion sequences, to get more tips and other relevant advice. Today, a rather worn out common mormon visited my garden and seemed to be trying to lay some eggs but after checking there were no signs of eggs. Then a lime butterfly came. So now I know who is in the neighbourhood but it is anybody's guess who the parent of my 2 pupae are. So I'll just have to wait a few more days. It's been a week since they pupated. Hope they eclose soon - before I go outstation and I will be forced to leave them outside. I'll try to get Bobby if I hv any questions. Keep u posted. Hi Horace, it's a Lime butterfly after all. 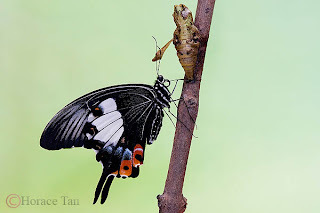 I missed the eclosion 'coz I was at work but my wife managed some shot of the butterfly still close to the pupa and after that I had a chance to take it out to the garden for some quick shots. 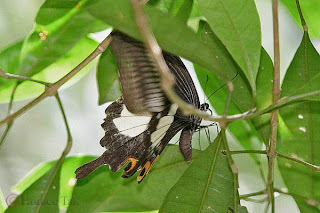 Thanks for the update on the eclosion of the lime butterfly. Both you and your wife did very well in taking great shots of the newly eclosed adult. Congrats for a life history well recorded. Great blog you have here. 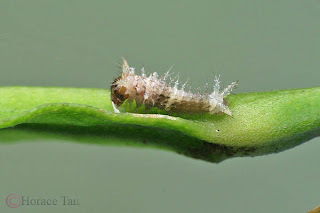 :)Anyway, I have a pupa of a lime butterfly and as i was observing it, it started to shake quite vigorously. Do you think there's anything wrong with it? Thanks. 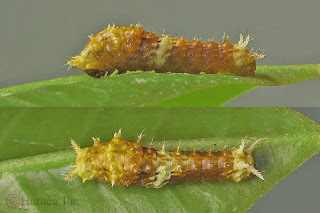 Sometimes a pupa might react with a shake or two to external stimulii like sudden loud noise, shining of strong light or even tiny insects crawling on its body. Keep observing. 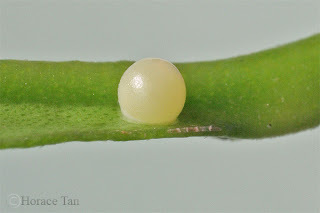 Hopefully you get the chance to witness the miraculous event of eclosion.